Trek to Kothaligad (Peth Fort) was specially organised to mark the end of my tenure at ISTE SAKEC as a General Secretary (To celebrate the free Saturdays!!). So, we decided a fine Tuesday and set off. First train to Karjat, that leaves CST at 4.44 AM (Dadar at 5.02 AM), was decided as meeting place for us five trekkers. The train reached Karjat (कर्जत) at 7.10 AM. This time we were Anurag Muley, Darshak Sanghvi, Manoj Patil, Devang and me. 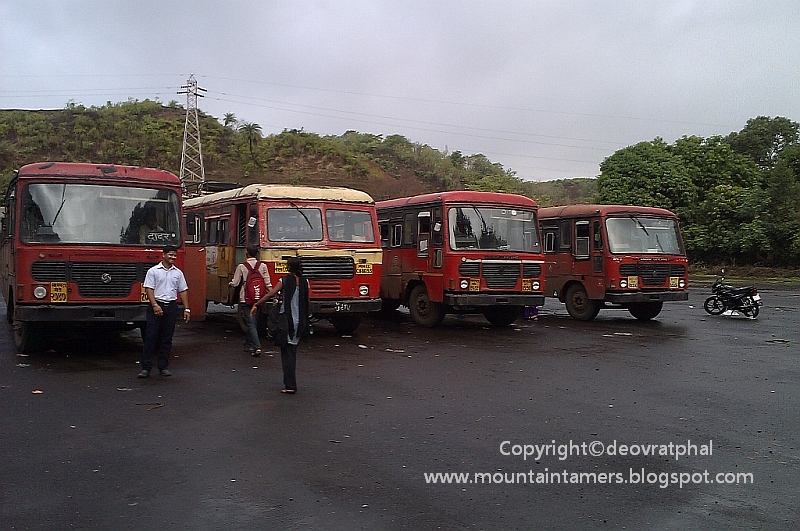 Karjat ST stand is just a 5 minute walk along the road parallel to the railway station to the east side exit. We had to catch the 8.30 AM Jamrukh (जामरुख) bus. 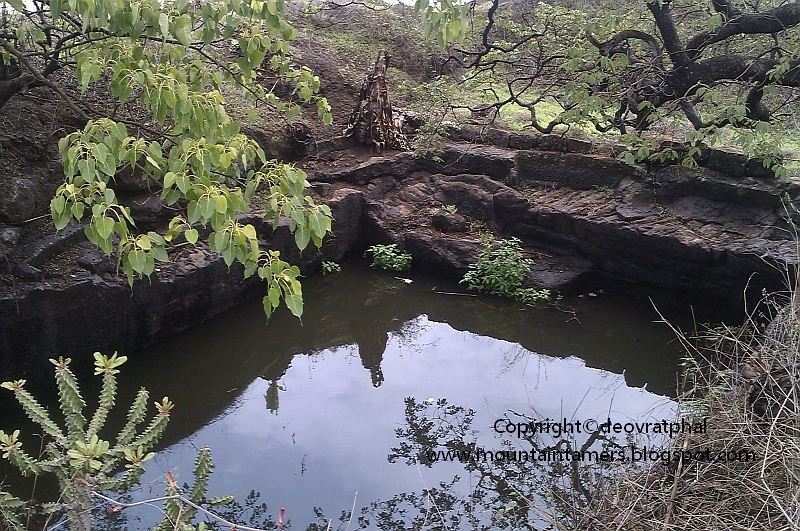 Ambivali (आम्बिवली) is village before Jamrukh, which is also the base village for Kothaligad (कोथळीगड). The bus dropped us at Ambivali at 9.35 AM, almost an hour of a journey. Per head cost of ST bus journey till Ambivali was 32 ₹. 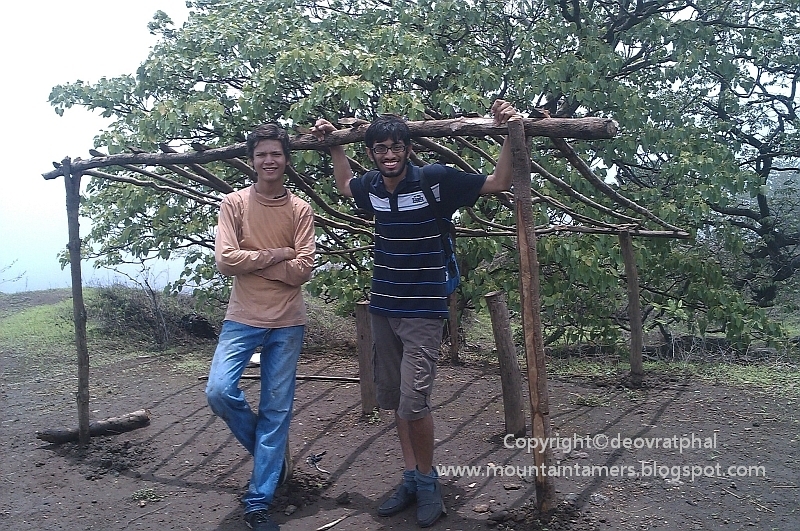 Started the actual trek at 10.00 AM from Ambivali. 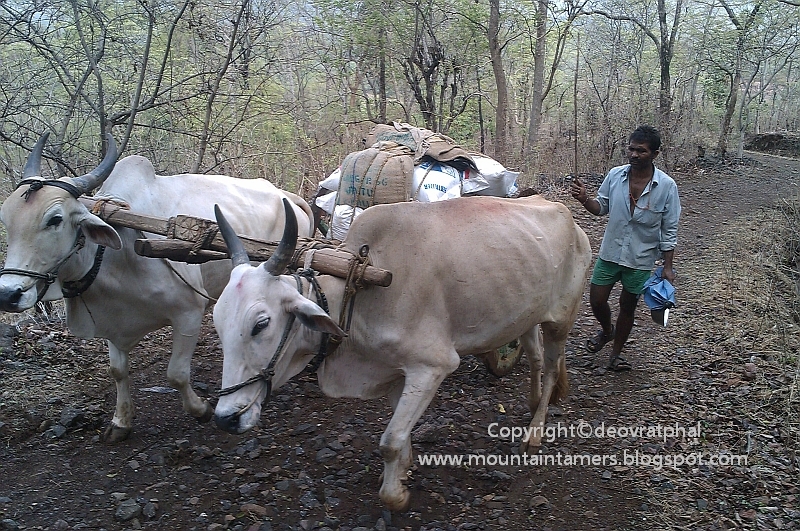 On the way we met this fellow villager, with his bullock cart, carrying his food stock to Peth (पेठ) village. After maneuvering the twisting and winding bywalk, we reached Peth village in 45 minutes. We managed to find a few approachable waterfalls and a few streams on the way to Peth village. But since they were not in our time-table, we decided to visit them while returning. The final climb advents from Peth village. The forest cover continues till the top of the fort. 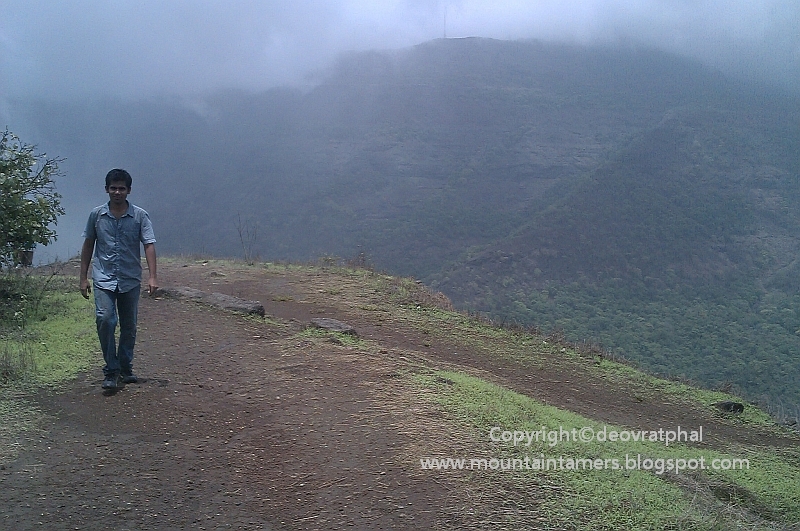 Throughout the climb, Rain happily poured and we too enjoyed its happiness. 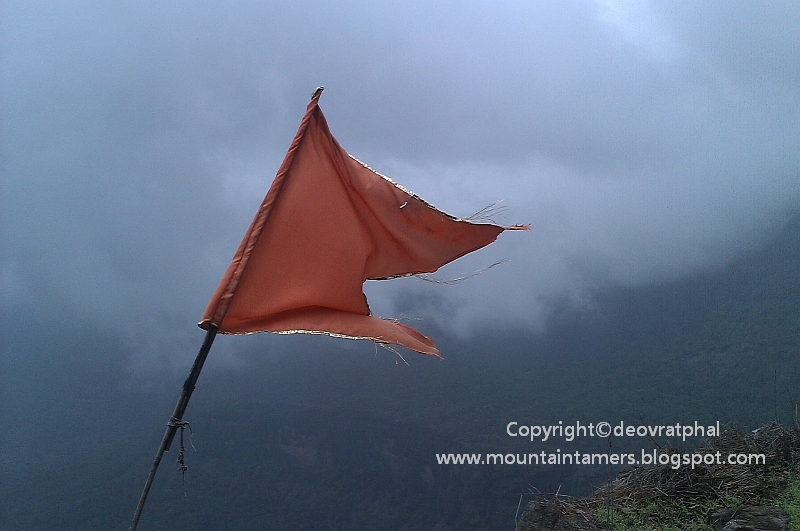 And sooner, we were on the top of the Fort. This was the biggest of the cave that could easily accommodate a crowd of 40-50. We preferred to eat our snacks outside, though, as the cave was filled with the stink of the bats. Extreme Engineering: To reach the top of pinnacle, rock cut steps are carved from inside the pinnacle, known as (कोथळी) in Marathi language. This route originates from inside a small cave. Each step is 1.5 to 2 ft. high. 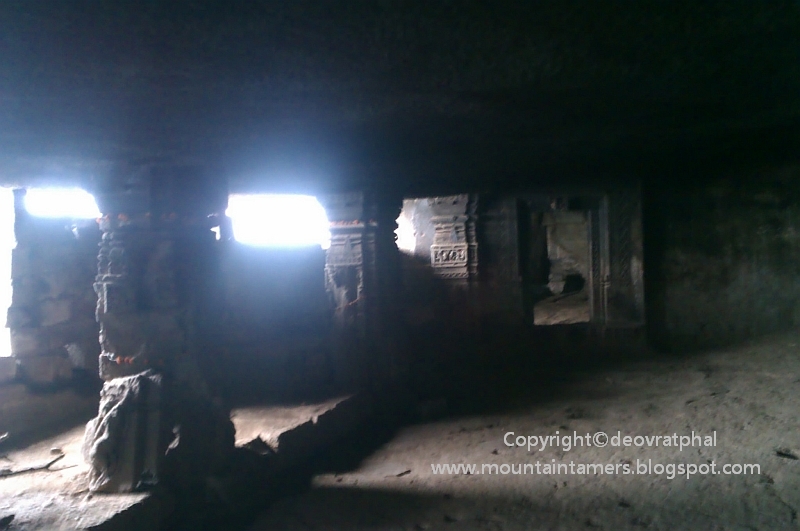 The whole structure is carved out of a single rock structure. Intention for making this Fort was to keep a vigil on the activities happening in and around Mawal region. It can be considered as a Medieval watch tower. 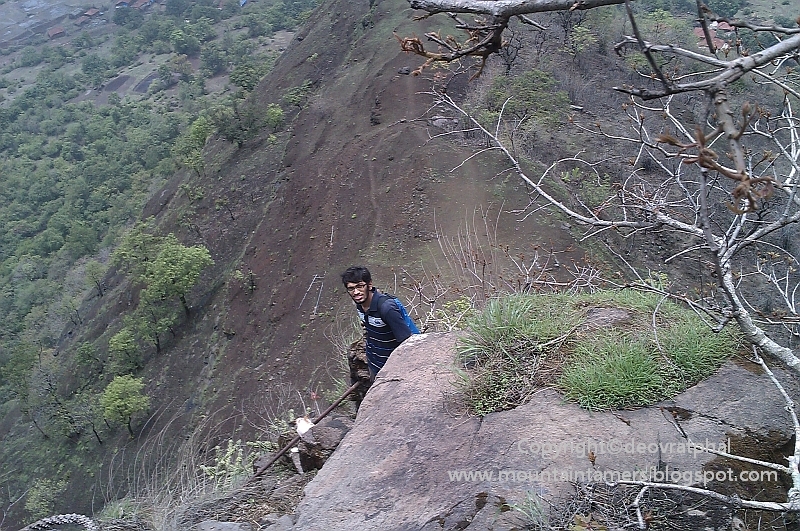 Reached the top at 12.00 PM, exactly after 2 hours of intense exploration at the base of the pinnacle. The route circumscribing the pinnacle was a bit risky, not fully but a few spots were. We still followed the route and found lots of water tanks, huge caves with small openings that could accommodate about 100 people at a time. The fort has lots to be explored. There was a temporary shelter at the top and behind this shelter was this small water tank. Water from this tank was not worth drinking. Came back to Peth village and halted at Bahiravnath Bhojanalay, a mini Restaurant run by Mr. Kiran Sawant. Rice plate (unlimited) for 90 ₹ was enough to overcome the tiredness of a day. In his courtyard we spotted a back portion of a cannon. As a story goes, some people from Agri community (आग्री) were attempting to steal this cannon when the villagers came to know about it and stopped them immediately. 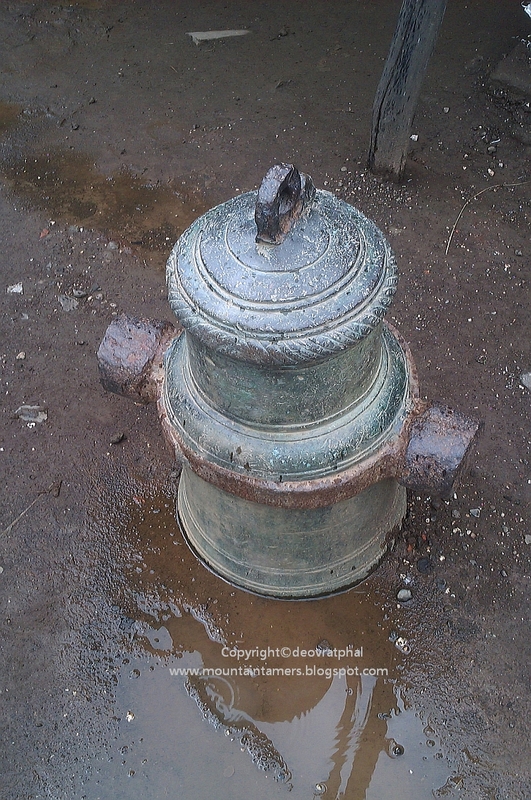 Thanks to the ancestors of Peth village we were able to behold the beauty of this cannon. 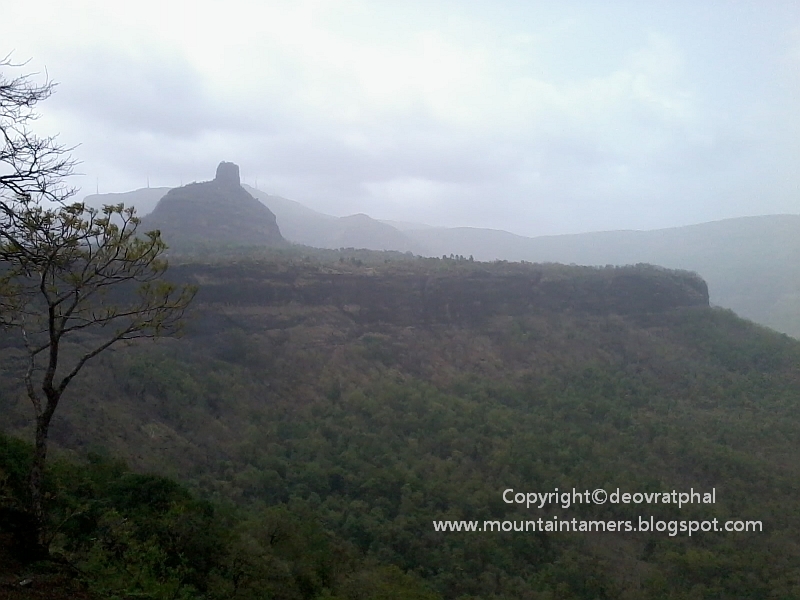 It was my second visit to Kothaligad, first was during my school days, when I was in 2nd Grade. This visit has surely helped me refresh the memories of my previous visit.